Do you want a whiter smile? Zoom teeth whitening will give you shiny, white teeth in just one hour and for a limited time it will cost you only £315! Think about how you’ll look on your Facebook, Instagram or holiday photos. Got a special date or wedding coming up and you’re worried about how your smile will look in the photos? Stained, discoloured or ‘yellow’ teeth are NOT a good look and can seriously affect your confidence! Teeth whitening is a fantastic choice if you want to immediately look younger, healthier and more photogenic. The amazing thing about having whiter, brighter teeth is that they actually look straighter and any flaws are minimised, even without the use of other cosmetic dental procedures. If you have already chosen to cosmetically improve your smile, then teeth whitening will finish off your new look perfectly . Teeth whitening is a brilliant gift! We see lots of brides-to-be, their family and friends, as well as those who have a big birthday, anniversary or social event coming up. Teeth whitening is a really effective way of improving your smile and helping you feel confident in front of the camera. Of course, you don’t need to wait for a special occasion. Teeth whitening can make you feel great at any time, improving your appearance and boosting your confidence. 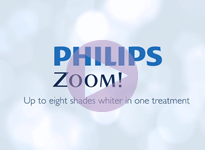 Zoom Professional Teeth Whitening is our most popular system. It delivers outstanding results, whitening all of your ‘smile line’ teeth at the same time (usually up to 8–10 shades lighter on the Vita dental shade guide)and, for a limited time only you can have an amazing whiter smile in JUST 1 hour for an incredible £315! How does Zoom Advanced Power teeth whitening work? The treatment consists of a gentle whitening gel, which is activated by a special, patented Zoom Advanced Power ‘blue spectrum’ light. It works in the same way that sunlight naturally whitens or bleaches things but it doesn’t release harmful UV rays or use heat or lasers to deliver it’s results. Clinical trials have shown blue-green light to be safe for skin, gums and other soft tissues, which makes it an excellent choice for teeth whitening. We know that you can buy cheap ‘whitening’ kits on the internet but these can SERIOUSLY cause you pain and damage your teeth and gums if not used properly. Don’t risk it! (Only approved dentists can use the Zoom Advanced Power System). Book your Free Teeth Whitening consultation with our smile adviser today.Call us on 01772 253 443 or email smile-adviser@adelphidentalcare.co.uk to find out more. Zoom Advanced Power tooth whitening is completely fuss-free with no gels or trays to take home. Just sit back and relax and let us do the rest. Your teeth will look whiter and brighter after just one hour. To take the next step to whiter, brighter teeth, simply book your Zoom Advanced Power teeth whitening appointment today. We even offer gift vouchers covering either part of or the full cost of your tooth whitening treatment. Call us on 01772 253 443 or email smile-adviser@adelphidentalcare.co.uk to find out more. Are you embarrassed by dull, discoloured teeth? Download our FREE brace guide and discover five ways modern brace solutions are perfect for busy adults like you.